Guitar aficionados and fiends will love the new release from George Bellas, The Dawn of Time. For others, after the 75 minute one song epic Step into the Future, this work may come as welcome return to more familiar and accessible territory. Using a canvas of shorter tonal compositions and the creation of the universe as his inspiration, Bellas again mesmerizes us with his brilliant bag of guitar tricks. Virtuosity is a word not wasted on this fret wizard. With 19 songs within, Bellas packs more music into The Dawn of Time than seems humanly possible, like a 21st century Todd Rundgren seeing how much cleverness he can stuff in his vinyl grooves. While Bellas is immensely inspiring throughout, the songs and his guitar work keep the listener hooked and listening. A raw and sometimes missing ingredient from some guitar hero works, Bellas' work turns on creativity and accessibility rather than alienation from the weight of his skill. Yet, I still can't help to think that Bellas, among other independent axe players, isn't just playing for the choir, his fellow musicians. Others may listen, smile, scratch their heads in amazement, and than simply set aside The Dawn of Time after one listen. It deserves more than that, but this seems to be the inherent nature and result for many instrumental works from guitar virtuosos. 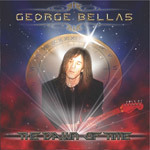 Guitar aficionados and fiends will love the new release from George Bellas, The Dawn of Time.